What if it's not molting? Discussion in 'Chicken Behaviors and Egglaying' started by MattalynsBarn, Jan 5, 2011. 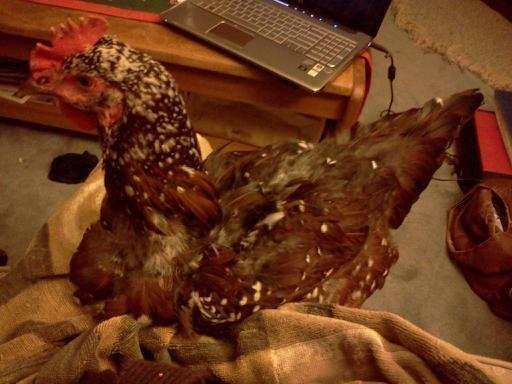 This is my first winter with chickens and yesterday I noticed one of my hens looks like she mostly has down (spelling?) left, except on her head. They're 8 and a half months old. The others are also losing feathers, but only on their backs. It looks as though the feathers broke off. I know it's probably a combination of molting and the roo, (who is a very nice roo) but what if it isn't? How can I tell? I haven't done any de-worming or any other kind of parasite control, mostly because I haven't been able to fine anyone who can give me any information about it. What you need to do, is pick up a chicken that looks questionable, and look near the vent area, way underneath the feathers, near the skin. If you see some creepy crawlies, you've got a parasite problem. Some people will check at night, because certain parasites are very elusive and hide well during the day, so you may want to look at a hen in the evening with a flashlight. If you do see mites or lice, then you can dust them with Seven Dust (or poultry dust) from the farm store. You just powder them up from top to bottom, and repeat that around 10-14 days later to kill the eggs that hatch. If you've got parasites, also, you'll need to clean out their coop real good, and powder it up too. Feather picking is also a sign of a chicken not having enough protein in their diet, but that shouldn't be the case if you're feeding a good layer feed. Thank you guys so much, tomorrow I will try to take some pictures of them (or at least the bad one/s). They're in a 20'-20' old dog pen, with a 4'-3' (ish) coop. I did look earlier today around the vent, but it was hard because the chickens were full of dirt from dust bathing. We did have enough snow the 26th/27th that they didn't leave the coop, could this be their bodies delayed reaction to the stress from that? There are 2 maybe 3 that have lost feathers on their back, 1 that looks really... well you'll see the pictures tomorrow, and the other 4 look fine. And of course Hamlet (the roo) is fine. Some of them are bald right below their beaks, which makes me think it's not feather plucking: how could one pluck there? Morgan7782's 4th picture is closest to my worst one, Vivian, but Viv is even worse... I give them mostly feed and not much scratch, and as far as I can tell they're not bored. Maybe I'll try giving them a toy of sorts... Hmmm... Anyway, thanks, again. I really hope it's just molting. 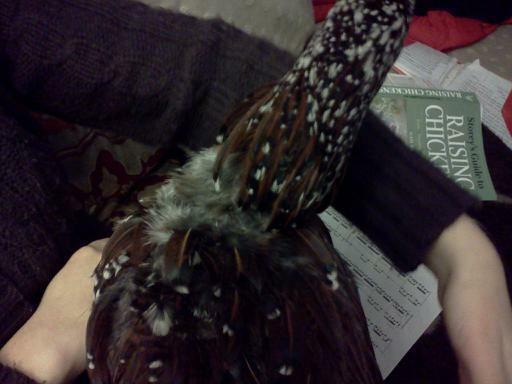 The missing feathers on the back makes me think it is the rooster. 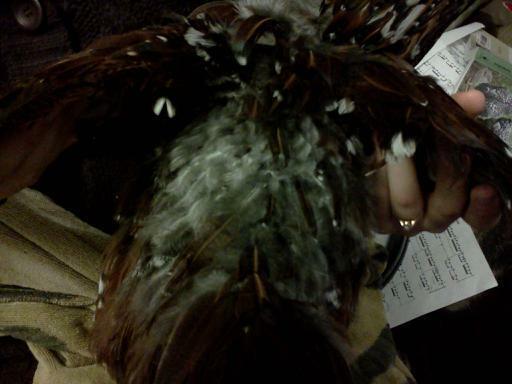 When they molt they shed head, neck, tail feathers and when my girl lifts her wings her "armpits" are bald. 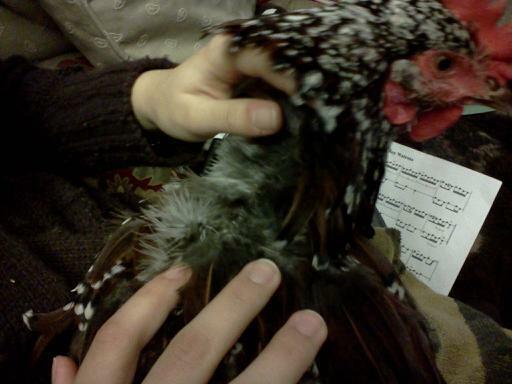 But she has not lost feathers on her back, maybe they are molting and the rooster is being a bit rough on them. Hope it gets resolved either way! Pictures should help and then you can decide whether to treat as a molt (i.e. 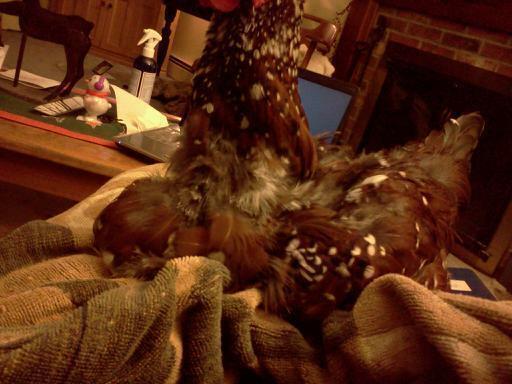 extra protien and such) or treat as rooster loving (i.e. getting saddles or something for the hens). Either way somebody should be able to tell from pictures if you are able to get any. Thank you. We have been looking in the chicken book while holding the hen. She started reaching around breaking or chomping on the feathers. 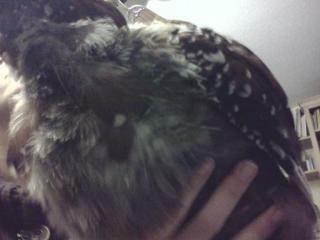 The feathers are missing from her lower neck, her back, and around her crop but not her head. I will post pictures as soon as I can. How likely is it she is doing this to herself?